A fire can happen without warning, and no matter how quickly it is extinguished you’ll be facing some fairly serious property damage. 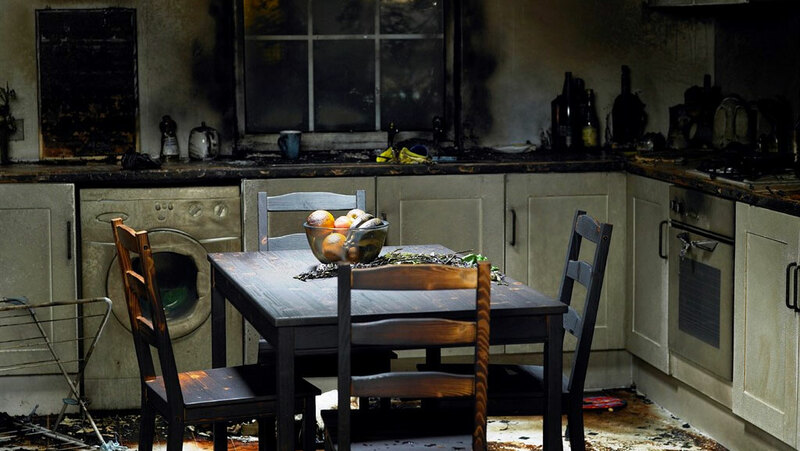 When fire damages your property, call the experts at Rewind Emergency Services and we’ll send a member of our fire and smoke damage restoration team right away. When a fire has happened on your property, the best response is the fastest one, and Rewind Emergency Services is the fastest responding restoration team in your area. We have people on call 24 hours a day, 7 days a week—including evenings and holidays—because water doesn’t wait, why should you? Call (714) 494-9940 or email sales@rewindes.com us anytime. One of the main problems property owners must face following a fire is the damage caused by smoke and the water used to put the fire out. Even though the water is invaluable to the process of containing and extinguishing a blaze, it can be extremely harmful to the environment it is trying to save. Water seeps into porous surfaces like wood, laminates, fabrics, carpeting and insulation, and moisture can linger below the surface for a long time. It can be difficult to properly dry out your property after a fire, because not only are you dealing with water damage, but that water mingles with the smoke, ash, and soot to create a sticky, acidic residue that gets into everything. The acidity of this residue causes it to etch and stain everything from fabric to metal fixtures to the plastic of your appliances—discoloring everything it touches. If this residue is not quickly and completely removed, it can ruin your valuable possessions, clothing, and technology beyond repair. Call the fire department first, but your next call should be to Rewind Emergency Services. The sooner we can get onto a scene, the higher the chances are that we’ll be able to save affected items. Once we arrive on the scene, and ensure that it is stabilized and safe to work with, the restoration team at Rewind Emergency Services will work to quickly remove unaffected and salvageable items, and protect areas that were unaffected by the fire itself. This prevents further damage by soot, smoke, and other chemical residues. After everything has been protected, we will evaluate what’s left and begin to remove unsalvageable materials from the affected area. When you use Rewind Emergency Services, you know that you are receiving quality service. We always dispose of unsalvageable materials in a safe and environmentally friendly way. At Rewind Emergency Services we always document every step of the cleanup process, working alongside your insurance adjuster to coordinate a favorable resolution for you and your property. It can be tempting to leave the windows open and hope that your property dries out on its own. That is a bad idea for several reasons. The first reason being the residue left behind by smoke, ash, and water mixing together—if left alone it will ruin items, even in areas unaffected by the initial blaze. The second reason is that many over the counter cleaning products won’t be strong enough, or formulated correctly to clean that residue off, and sometimes it can further damage your property. Also, cleaning an area yourself can affect your insurance claim, not to mention creating unsafe conditions. At Rewind Emergency Services we have been trained to safely deal with a possibly hazardous scene, don’t risk it yourself. The last reason is that when an area has been saturated—such as the aftermath of a fire—the moisture that evaporates adds to the humidity in the air. Whenever the humidity in an enclosed area reaches 45%, mold, mildew and bacteria find hospitable ground to breed. Once mold gets into a place it forms a colony, releases spores and continues to propagate—so now you not only have to deal with the aftermath of a fire, but also mold. Don’t worry, though. At Rewind Emergency Services we have lots of experience eradicating mold, and we will bring that knowledge to bear on every job involving water damage restoration. Mold is always a threat, but that threat can be curbed with the proper procedures and precautions. At Rewind Emergency Services we not only handle fire and smoke damage, water damage and sewage cleanup, but also mold removal. Much like the water that spreads it, mold likes to occupy places that are hard to reach, such as the space between your walls, under the floors, and in attics, basements, and bathrooms. We have the tools and the techniques necessary to not only remove mold, but remediate the conditions that allowed it to propagate in the first place. One of mold’s trademark characteristics is a nasty, musty odor. That smell can get into everything—clinging to your hair, skin, and clothing. Mold spores are microscopic and float on air currents, but they can stick to, and travel by, nearly any means—clothes, shoes, skin, pets—you name it. The only way to prevent mold is to monitor the humidity inside the building, and remediate that moisture at its source. Whether the source of unpleasant odor is mold or smoke damage, or even pet odors, Rewind Emergency Services can sanitize and deodorize your property, restoring it back to its pre-loss state. We use only earth-friendly, green cleaning solutions that are environmentally friendly and safe. Call Rewind Emergency Services today, and breathe a little easier. At Rewind Emergency Services we know that every job, whether commercial or residential, is unique. Our restoration professionals are all extensively trained as well as certified by the Institute of Inspection Cleaning and Restoration Certification (IICRC). We know all the most advanced cleanup techniques, for removing soot, soil, and damaged structures, and we will not stop until your home or business has been completely restored.